The weather is supposed to be beautiful. We have an interesting three part day planned. It should provide interesting sites to draw and good socializing. Part 1: We meet at the Hudson River Greenway at 44th Street at 10 AM. There is a small park on the far side of 12th Avenue that should provide great views of the river and the Intrepid Sea Air and Space Museum. 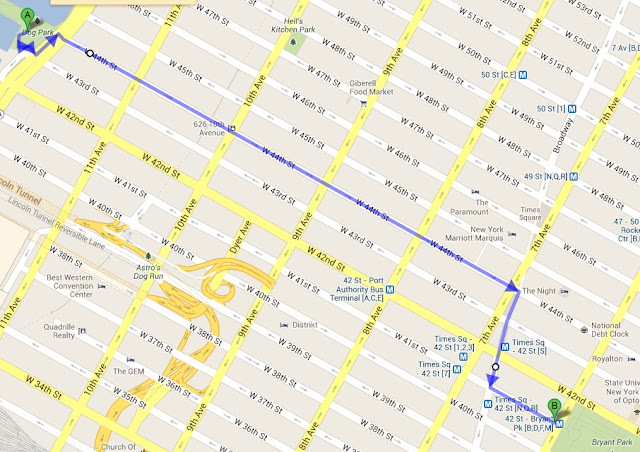 Part 2: We leave at 12:30 and head cross-town for a picnic in Bryant Park. Bring your own food or buy on the way. As you enter the park from the 41 Street entrance on Avenue of the Americas we’ll be on the right side in the shaded area by the lawn. The public chairs can be moved where you want. We’ll either be seated in the shaded area or on the nearby grass. Part 3: The Big Apple Knitter's Guild is holding a Knit in Public Day starting at 2:30. The beauty of sketching knitters is that they sit patiently and hardly move – ideal for perfecting your people drawing skills.